An internal UCSF study finds that 82 percent of the text in a typical Epic progress note comes from copying/pasting or importing from other sources. 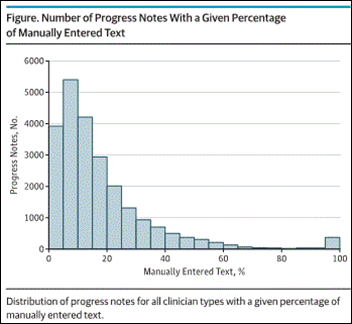 Clinicians physically enter only 18 percent of the note. Several hundred of the 24,000 notes reviewed contained no human-entered text at all. The study is especially interesting because it used a new text analysis tool – apparently provided by Epic – to determine the source of every character of text in the note. From Jack Fruit: “Re: CommonWell. Who were the original members?” CommonWell Health Alliance was founded in March 2013 by Cerner, McKesson, Athenahealth, Greenway, and RelayHealth (which is also owned by McKesson) as the Epic fears of the publicly traded competitors intensified to the point that they cooperated (and pony up a rumored $2 million each) to have something to announce at HIMSS13. Since then, McKesson has mostly pulled out of healthcare IT by spinning off Change Healthcare and looking for a buyer for its enterprise business and Greenway Medical Technologies was taken private by Vista Equity Partners a few months after the CommonWell announcement. Athenahealth shares are up 38 percent since the announcement, those of Allscripts are down 10 percent, and Cerner shares have risen 41 percent as all the founding companies have tried to diversify themselves out of a HITECH-free EHR market. CommonWell later added CPSI (now Evident) and Sunquest as founding members in mid-2013, but Sunquest is no longer listed as such on its site even though Sunquest’s site still says it’s a member. From Kathy: “Re: CommonWell survey. It would be most accurate for me to vote that it performed exactly as I expected – which was very little. CommonWell was never going to work. It was a political and business tactic.” Above are the early poll results. Does the writer enough knowledge and experience to be trusted? Does the article tell me something I didn’t already know? Can I really use the information? Does the writer present the information clearly, concisely, and at my level, without time-wasting padding or distractingly unskilled writing? Am I entertained, amused, or emotionally motivated in a positive way that makes me want to read more by the same writer? From FlyOnTheWall: “Re: Mary Piepenbrink, RN. Joined a startup called Pieces Technologies as SVP of sales. What do you know about them?” I’ve heard of the Dallas predictive analytics company, but only barely. They’re a Parkland Health spinoff as I recall. Founder and CEO Ruben Amarashingham, MD, MBA has good credentials in informatics. The company raised $21.6 million in a single Series A round just over a year ago and apparently has earned a couple of customers. The web hosting company is migrating the site to a bigger server, so let me know if you see anything weird, other than the fact that I’m posting this later than usual to accommodate the switch. You’ll see some inarguably huge news related to a Meaningful Use-related EHR vendor settlement coming out, possibly as early as later today. The financial terms are mind-boggling. More to come once the Justice Department’s announcement is released. Health management software vendor Mediware Information Systems acquires Kinnser Software, which offers home health and hospice systems. Consumer health information site Sharecare, founded in 2010 by Dr. Oz and WebMD founder Jeff Arnold, receives an unspecified investment from Summit Partners, increasing its total to more than $300 million. Google launches the free Data Gif Maker, a data illustration tool aimed primarily at journalists who need to tell data-driven stories but potentially useful to a wider social media audience. Medisolv chooses CloudWave’s OpSus Healthcare Cloud for making its quality management system available to customers as a SaaS offering. Nordic announces that it has grown to 700 consultants serving 200 clients. Reaction Data publishes a new report on patient referrals and self-scheduling. The CEO of Blue Cross Blue Shield North Carolina says that the ACA marketplace is stabilizing in price, utilization, and risk to the point that an 8.8 percent premium hike would have sufficed for 2018, but instead the company has filed for a 22.9 percent increase because the White House keeps saying that it may not continue paying the premium subsidies that have been challenged legally. “The information we’ve seen coming from the administration actually creates more uncertainty,” the CEO says. Ascension-owned Seton Healthcare (TX) says it has identified “suspicious activity within our network,” but provided no details, although it sounds like a ransomware attack. Meanwhile, patients report to the local TV station that the hospital has gone back to paper after warning employees to shut down the computers. A study finds that hospital EDs charge an average of 3.4 times the Medicare-paid rate for services they provide, providing as an example EKG interpretation, for which Medicare pays a median of $16 but for which hospital EDs charge other patients anywhere from $18 to $317, averaging $95. The highest-charging hospitals are for-profit, mostly in the South and Midwest, and serve more uninsured and minority patients. USA-based Syria medical aid group UOSSM launches Syria Solar, a project to install solar power systems in the country’s hospitals, which run generators that use erratically available diesel fuel. Much of Syria’s electrical grid has been destroyed by bombing, leaving already struggling hospitals to deal with power outages for incubators, dialysis machines, and other vital equipment. Rapidly rising drug prices are hitting seniors hard with higher co-pays even as Medicare’s share of the Part D cost has become its fastest-growing expense. 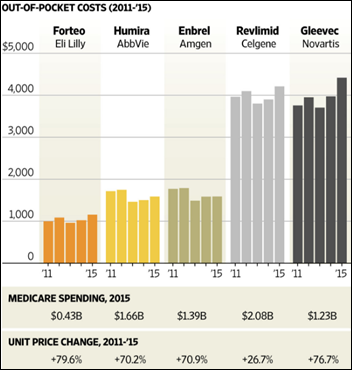 Novartis AG has raised the price of cancer drug Gleevec 77 percent in the past five years, increasing Medicare’s annual cost from $500 million to $1.23 billion and leaving the average Medicare patient paying $4,400 per year out of pocket. I’ve read that Europe has become even more overrun with summer tourists in the past few years because huge-population countries like China and India are moving up the economic food chain and their now-wealthier citizens are joining the lines in Rome, Paris, and London. A New York Times article says that’s also true in healthcare, as frustrated, affluent citizens of China are bypassing the country’s overloaded hospital system and paying cash for care in the US and other countries despite the inevitable problems with transoceanic care coordination. A Wall Street Journal article questions whether towns should continue operating tax-supported nursing homes, seven percent of which are government-owned. Their financial losses are increasing due to a glut of Baby Boomer residents, a high proportion of Medicaid residents as those with more assets seek out tonier facilities, and the White House’s proposal to cut Medicaid by nearly a trillion dollars. Cities are selling their nursing homes to private operators with mixed experience. The article profiles the city-owned, 45-bed nursing home in Cape Cod’s Nantucket, MA, which is losing $3 million per year, needs major repairs as the city grapples with other huge infrastructure upgrades, and attracts only the financially struggling year-round residents who would have to move out if the city’s only nursing home shuts down or raises rates. AdvancedMD publishes a MIPS Improvement Activities fact sheet. Aprima will exhibit at the Associated Professional Sleep Societies Annual Meeting June 5-7 in Boston. Audacious Inquiry publishes a series of white papers on what HIOs need to know about the 21st Century Cures Act. Datica will present at the Wisconsin Entrepreneurs’ Conference June 6-7 in Madison. Carevive Systems will exhibit at the ASCO Annual Meeting June 2-6 in Chicago. Casenet will exhibit at AHIP Institute & Expo June 7-9 in Austin, TX. Docent Health is featured in Redox’s “Digital Health Done Right” series. Dimensional Insight will host its annual User Conference June 5-8 in Boston. I’m watching for the government’s announcement to go out. The numbers boggle my mind, anyway, but maybe that’s a low bar. What?!? Affluent Chinese are frustrated with gubberment run overloaded hospitals and choosing to pay cash elsewhere? Hmmm.